Some of what you're about to see is ridiculously cute and sweet and may lead to a toothache. Stop me if you've heard this before: This morning I stopped by an estate sale that had already been open for a couple of hours. This is my motto regarding estate sales: Arrive late, don't expect much. This sale had His & Hers outbuildings -- His was all tools & bolts & drill bits but ... Hers was dedicated entirely to vintage holiday crafts! And there still was plenty to choose from despite my late arrival and low expectations. I just couldn't help myself but I probably should have. This summer's yard sales have resulted in an unexpected 'abundance' of vintage Christmas everything, so I've decided to sort through it all, keep only what I really, really love (I might need one more 'really' in there so I'll actually get rid of something) and am most likely to use (snore) and then the rest will go in my etsy shop. I may be experiencing a delayed reaction to the silverware hoarding at Estate Sale 2.0. 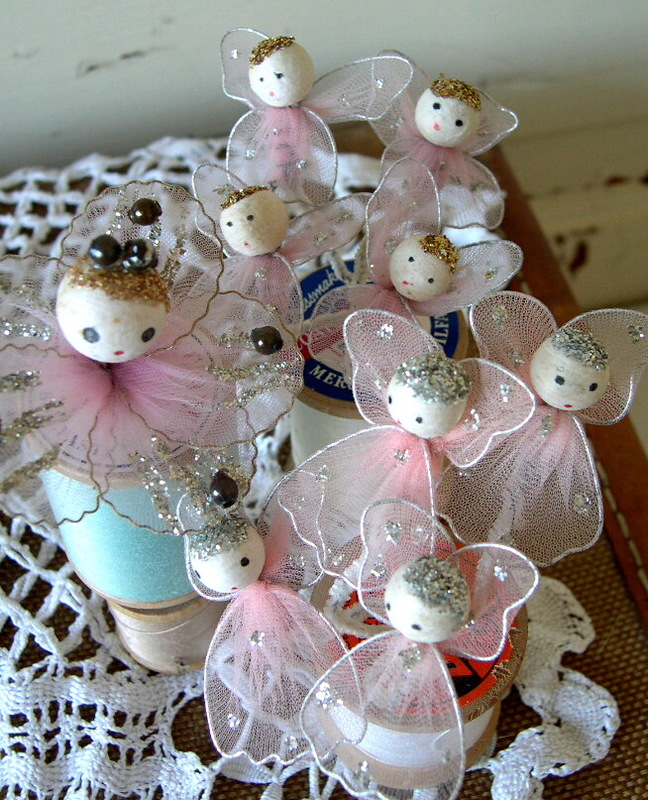 So hard to resist ... how cute is this little bunch? There was also a bit of vintage Easter which included this barnyard of cuteness. I found one vintage Christmas tablecloth which came with (no extra charge!) a glob of vintage Christmas dinner. Kind of like a really gross gift-with-purchase. The offending tablecloth came home and is currently taking a timeout soak in the vintage-linen-laundry-bucket. Did you get ALL of those ornaments at one sale? Wow! Great find!! Hope you put some of THOSE on Etsy! I want ! LOL! 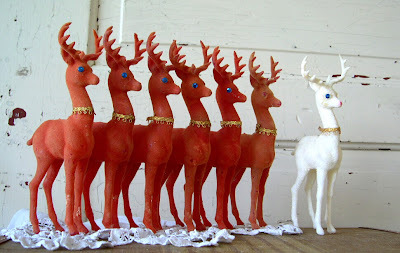 Your vintage Christmas finds are the best eye candy-love it! Great finds!!! I found a couple sweet elfs a couple weeks ago with their tags/story on them. 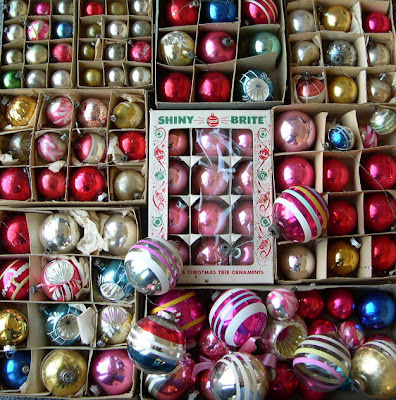 I did get all of the ornaments at the same sale - I couldn't believe no one else grabbed them before I got there. My lucky day! i think i chuckled through this entire post. a very fun read and glob aside -- wonderfully cute finds! What wonderful ornaments and love the chorus line of the little flocked reindeer. 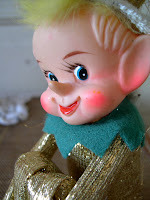 I don't think that little pixie is creepy - he is really cute! Oh, my goodness...what fabulous finds! Love it all--well, maybe not that glob of vintage dinner! Such cuteness! My most favorite are the RED reindeer. Great finds. Total, total envy here on this end. A building dedicated to vintage holiday crafts? A dream sale in my world! Great finds except for that bit of holiday dinner. One can never own too many vintage Christmas decorations, in my opinion. I wouldn't have been able to resist either. Oh, that elf is adorable, not the least bit sinister! But then I'm a doll collector - and to many people antique dolls are very, very scary. Scarier than clowns and elves. The angels are my favorite. Love your posts! These are all very lovely (and would not have been waiting there had I been to that sale before you, which seems quite unlikely, living on a different seaboard and all). The pointy cheeks on those elves frighten me, too, but people keep buying them from me, and therefore I will keep buying them. But I find them a little haunting. Cannot wait to see the tablecloth!!!!! Please post a pic after it's done bathing! Can't believe all of that was still there!! You really found a "treasure chest". Love the deer and the chicks. I am hoping you might be selling some of those ornaments on your etsy shop??? Girl, you do know how to do the estate sale thing the right way! I never find anything good....perhaps because I never go to estate sales. The vintage Easter barnyard collection is adorable. When you were showing your Christmas finds earlier this summer, Christmas seemed so far away, and now here we are with it just around the corner! You have such a lovely blog! I'm glad I stopped by...LOVE the vintage ornaments they are always a good find! you have quite an impressive collection, miss amy! lol about the reindeers! Wow! The estate sale Gods were smiling down on you! I love the vintage Christmas goodies! Especially the reindeer. I think you must have been at my Nana's house. She had all those reindeer and ornaments ~ more tablecloths than I have ever seen (never used them though) and that little elf always scared me as a child (still does kinda). Great score!! !